Create animated Enterprise Architecture Blueprints yourself by signing up for a Trial Account. The Dragon1 Step-by-Step Guide is waiting for you in your Digital Workplace. Here we'll present you an example Enterprise Architecture Blueprint Diagram. This architecture blueprint was created by a Dragon1 user and next it was anonymized by this user so we could publish it here. The architecture blueprint shows what situations were unknown for the organization (items colored black) at the time of doing the enterprise architecture quick scan. This diagram shows also a projection of certain issues with regards to the strategy. This architecture blueprint was for this reason used as management report view to support strategic decision making. An interesting link to another enterprise architecture of the Government of Canada is this one. 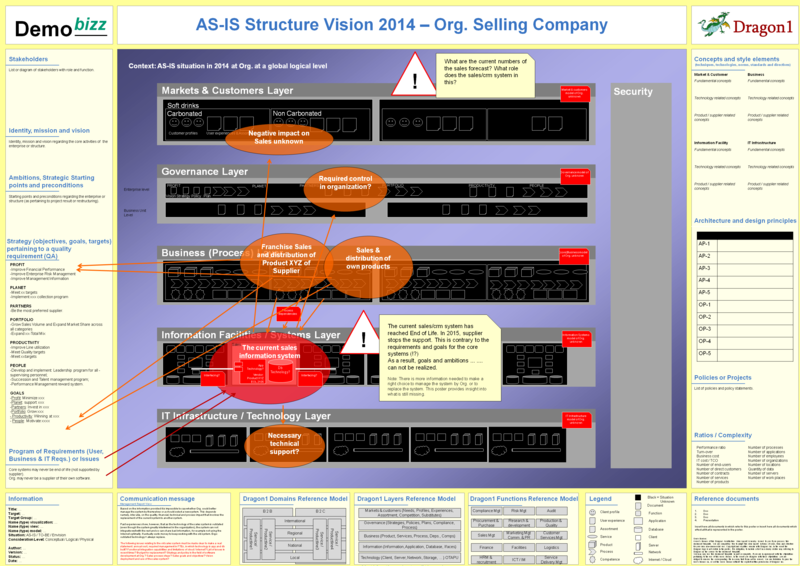 We hope we have inspired you to start creating enterprise architecture blueprint diagrams. If you do not have the time and you need a Blueprint diagram on short notice, we can create a Bluerprint for you.